Daniele Ciurleo-Larubina’s essence of his mastery lies in the seemingly effortless ability to transition from musician to composer, from arranger to conductor. Born in Australia the late 1960’s to Italian migrants, Daniele grew up surrounded by the music his father Michael found inspiration in: the classic Neapolitan and Italian popular songs of the 1940’s, 50’s and 60’s. “Given different circumstances, I believe my father would have been a talented and very capable musician,” Daniele says in his quiet manner. “He could carry a tune quite well and knew just about every Italian song ever released.” Part of that enormous repertoire was of course the songs made popular by stalwart events including the famed Sanremo Song festival. These songs, born in a land on the other side of the world, stirred a desire in the young Daniele to understand the method and sentiments behind the music, to get at the heart of the melodies. By the time he was thirteen, Daniele was studying classical guitar to connect with how he felt deep inside. Little wonder that after taking up the double bass in his final years at Melbourne High School, Daniele would go on to study Performance in Guitar at the Conservatorium of Music, University of Melbourne under the guidance of esteemed Associate Professor John Griffiths. Not surprisingly because of his intrinsic talent, Daniele was in high demand to join various musical ensembles and groups, often switching between playing the contemporary music and his love for more fully orchestrated recital and performance work. It was the influence of his early formative years at the feet of his father that kept calling to him. This eventually led Daniele to shift his emphasis from simply playing music to a more technical demand of arrangement, orchestration and conducting. 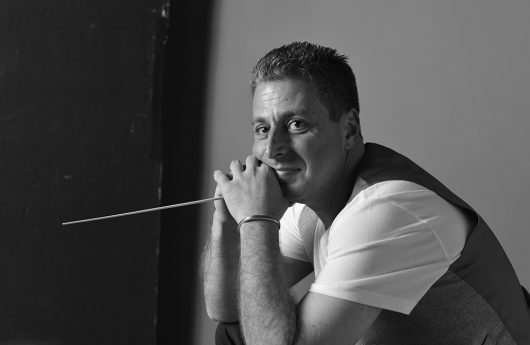 In 2012 Daniele formed the ‘Fusion Pops Orchestra and Choir’, playing – as the name suggests – arrangements of popular songs given an orchestral bent. So successful was this initial foray into this genre. What started out as an ensemble of modest size, grew into a 50 plus member, full symphonic orchestra with rhythm section and a 25-voice choir. This popular music with a classical slant would go on to perform a string of sell-out shows repeatedly over the years, and include works by David Bowie, Elton John, Billy Joel, The Beatles and even Led Zeppelin. Nevertheless, even this success didn’t dent Daniele’s desire to bring the music of his Italian ancestry and heritage to an audience who yearned for the music of their youth, or that audience who had never really listened to the music of their forefathers. And so, ‘Canzoni Di Mio Padre’ was born (Songs My father Taught Me): a programme of Neapolitan and Italian popular music that Daniele has orchestrated and breathed new life into while still respecting the integrity of the original versions. From this, some twenty songs from the so-called ‘Golden Age of the Italian Song’ have been completely rethought and reorchestrated to take the audience on a journey, both nostalgic yet fresh and vibrant. Featured are the songs of such greats: Claudio Villa, Enrico Caruso and Luciano Pavarotti; songs that sweep the eras of Belle Époque, the First and Second World Wars and the Sanremo Festival years. There are also the masterful and immediately recognisable Neapolitan songs including: Tango Del Mare, Funiculí Funiculá, Non Ti Scordar Di Me, and of course the perennial favourites Volare and Luna Rossa. Following both critical and audience acclaim in Adelaide and Melbourne in recent years, this showcase returns to Melbourne in late October and early November, at the beginning of an Australia-wide tour before heading off overseas in 2018, including performances in China and Japan. Archimede Fusillo has worked as a Features Writer for Vive La Vie and Vie La Cuisine international magazines, as well as being writer and translator for the Alfa Romeo magazine Quadrifoglio. He has also written for various other magazines, reviews, newspapers, journals as well as for radio and TV. Archimede’s short stories and novels have won many literary awards both in Australian and overseas, including being awarded an international Literature Fellowship by the Italian Services Institute and the Nino Sanciolo Arts Prize for Literature. Most recently Archimede’s co-authored novel-Veiled Secrets set in southern Italy, was published in the USA to much acclaim, and is being followed up by a new novel Summer Of The Purple Beret. Archimede is a regular speaker and presenter at conferences, schools and institutions of learning in Australia and Italy, frequently running writing workshops to an array of diverse audiences.